Two photographers have filled this loft with plants, light, and color, as well as found objects from vintage markets and travel adventures. Artist, designer, and entrepreneur Bryan Sears lives a creative life, and the large loft-like space he rents in Brooklyn reflects that. Full of light, great art, and lots of plants, the industrial architecture of the building is a warm backdrop to all of his things. It’s also a testament to the power of a free find. In Bryan’s building, there’s a location where people leave things they think others might want… the “Freeshelf.” Quite a few of the items in this home share an origin of the freeshelf. Those items, mixed in with Bryan’s art, make for one very unique home. Emma Orlow doesn’t just write about food, she makes art with it. Among some of the things she’s done with food, according to her website: Representing the varied food histories of Brooklyn neighborhoods in an edible installation; turning a tablecloth into a coloring book using spices, and creating a performative dining experience in an abandoned department store building, to name a few. When it came time to decorate the Brooklyn apartment she shares with roommates, Emma used the same visual tools seen in her work: Fun and playfulness. When Thomas moved into his studio three years ago, functionality and style were his primary concerns. “This is the first place I’ve actually invested in. Before, I just had IKEA everything.” Despite its proximity to a grade school playground (literally across the street) and shop-lined Brooklyn streets, thanks to Thomas’ signature style, the space captures the coziness of a log cabin. Hayley Cranberry didn’t just design her apartment to look good; she designed it to feel good. In fact, her apartment was crafted to be a safe haven from the chaos New York City can be. It was also thoughtfully arranged to help support her life, career and health. Hayley lives with a chronic illness known as ulcerative colitis, so her home isn’t just where she stores her stuff and sleeps. It’s where she seeks comfort, creates her art, and heals when she needs to. Textile Designer Rebecca Atwood isn’t the only one with talent in her family. Her sister, Grace Atwood, started (and runs full time) a blog called The Stripe as a “source of inspiration for the modern woman” eight years ago, covering all sorts of topics like DIY, beauty, fashion, travel, design, and more. Grace recently made the move from a small studio apartment in Manhattan to a roomy rental in Williamsburg, and she’s spent the last year designing a space as bold and inspiring as her blog. Architect Rachael Bennett doesn’t think you should be scared of designing without color. “I find many people think that ‘neutrals’ or ‘black and white’ is either going to be boring (beige on beige on beige, or worse, sterile and cold),” she writes. “But the amount of richness and warmth you can create with just texture, pattern, and materiality, makes for a space just as visually interesting as one with color.” Her home—a 900-square-foot apartment she’s been renting for over six months—may not have a bunch of bright colors, but it does show how you can master the art of layering to create a bold, monochromatic home. Donna Henes is an internationally-renowned urban shaman, contemporary ceremonialist, spiritual teacher, eco-artist, author, speaker, and workshop leader. Mama Donna, as she is affectionately called, uses her sacred space and home as a ceremonial center, spirit shop, spiritual practice and consultancy where she offers intuitive tarot readings, spiritual counseling, and works with individuals, groups, institutions, municipalities and corporations to create meaningful ceremonies for every imaginable occasion. “Sleep on any major changes before committing,” is Katherine Steinberg’s sage advice. And after taking on a full-blown renovation when she moved into her Brooklyn apartment over two years ago, she’s had a lot of experience with making big updates in her home, everything from moving the location of a staircase to picking out wallpaper. “I have a tendency to make impulse decisions and I get very impatient. Waiting to get wallpaper samples and trying out a few different kinds helped me live with my decision,” she says. 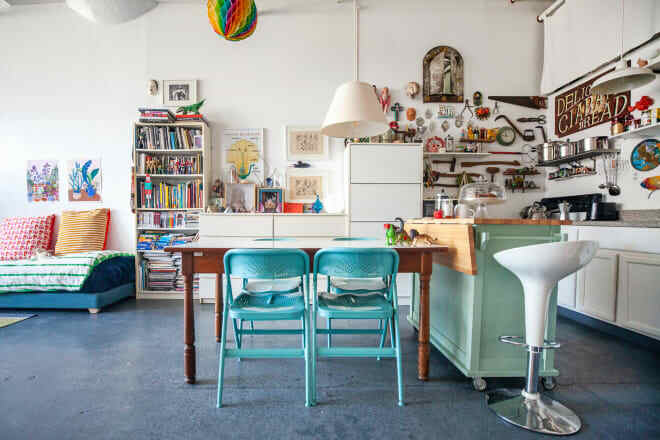 The colorful jungle space that is Rachel Hornaday‘s third-floor Brooklyn apartment is actually a museum filled up with all of her beloved collaborations, collections and curiosities. The photo stylist by day/artist all the time has decorated her three-bedroom home in a comfortable way that tells the story of a creative always willing to be inspired. Plant pots overflowing with leaves and vines, walls dripping in hangings, tapestries and frames, tabletops sprinkled with trinkets and instruments of creation, all display Rachel’s appreciation for multi-media.